If you’ve been following our 30–day introduction live streaming series or our 30-day HIIT challenge, I often mention that my Excy workouts tend to be 20 minutes, 5-6 days a week. I go as hard as I can for 45 seconds at high resistance, and then rest for 30 seconds. Recently, Mike, co-founder and Excy chief builder, challenged me to only try 1-2 minute workouts at very high resistance two times a day. I was coming off the heels of reading “No Sweat” by Michelle Segar, so was feeling really pumped about the challenge to focus on moving and was curious if I would maintain my weight (I owe you a book report on this later…I love what she has to say). For the entire month of February, I didn’t do one cardio workout and instead focused on high resistance small workouts 1 or 2 times a day for 1-2 minutes. On March 1, I sent Mike a note. My conclusion…I didn’t lose any weight. I didn’t gain any weight. I didn’t lose tone. I didn’t gain tone. In short, I maintained my weight (I have lost close to 25 pounds during my Excy journey). Each decade, it felt like I put on 10 pounds between my 20s and 40s, so maintaining weight is pretty exciting. I attribute the results to high resistance movements where I could still focus on maintaining my strength. It was only for one-month, so it’s not scientific, but there is a lot of science to back up the power of moving more in our everyday lives. Everyone is different and will have different results, but it did really capture the importance of moving for me overall. I will admit that I missed the cardio. In fact, one day, my body craved it so badly that I went on a run (I can’t run more than 1.5 miles without severe pain, so this was a big deal for me). I will be returning to my 20 minute Excy HIIT workouts, 5-6 days a week and not because of a goal to lose weight, gain tone, etc., but because I like the way the workouts make me feel. The short intense resistance movements give me energy, help me sleep better and I enjoy pushing myself hard. 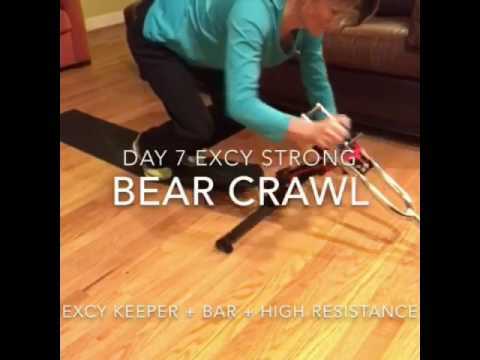 However, I will be adding at least two 1-2 minute segments of very deliberate strength training movements at high resistance in the morning and the evening. So often, if we can’t get a full workout in, we just skip it. We think to ourselves, “I don’t have 20 minutes or 45 minutes to exercise,” so we postpone it until the next day, then the next, then the next. Check out Our YouTube Channel or Facebook for more video tips, but here are a few that I focused on in February!